This easy recipe for pan-seared tuna steaks with tomato spinach sauce has ALL the good tastes, and is ready in a half hour! 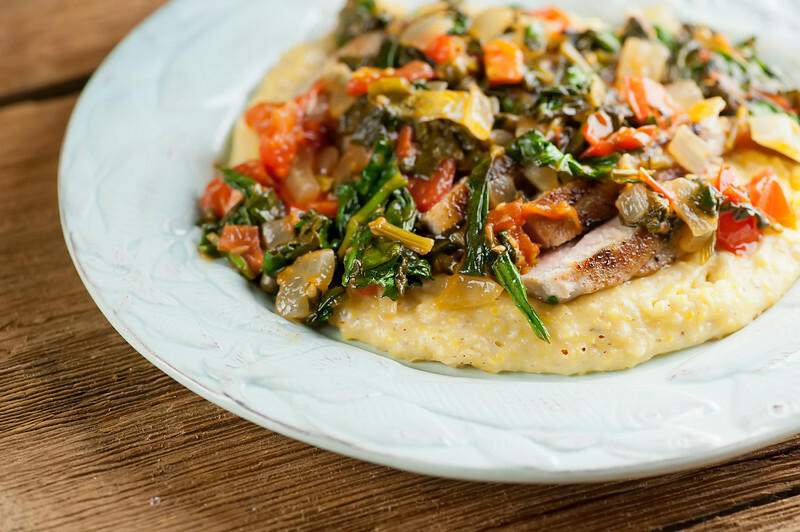 And if you want to take it to the next level, try it served over creamy, dreamy polenta or grits. Healthy deliciousness! Here’s the thing with this recipe for pan-seared tuna steaks with tomato spinach sauce. It’s one of those times where the finished dish is so scrumptious, but no matter how many times I took its picture while I was writing and testing the recipe, it just didn’t take a pretty picture. And so welcome to the age-old food blogger conundrum: you want to share this deliciousness, BUT THE PICTURE IS MAKING YOU CRAZY. And so after agonizing for a while, I decided you guys needed the deliciousness, and that you would forgive me on the less than photogenic-ness. If you want to see some prettier recipes, please click here and here and here. In the meantime, let’s make it! Meantime, I need to tell you what tipped the scales for me in terms of posting this one. You know how when you put all the holiday stuff away in the attic, and it takes ten thousand years to get it all up there, and you finally close the attic door and breath an exhausted sigh of relief? And then the next day you inevitably find one dang thing that didn’t make it up there and you just don’t have the emotional strength to put it away and so it hangs around until the next December? Well, for us this year it was the wreath hanger that hooks over the front door. SIGH. And so I stuck it somewhere out of the way, saying a silent prayer that I would remember where I hid it when December rolled around again, and then this week THIS happened. 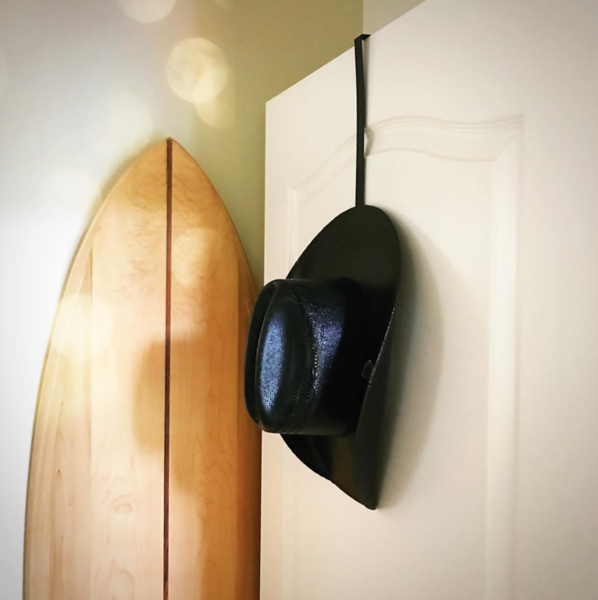 The Southern husband discovered it and put it on the door of his study and hung his cowboy hat on it. And for some reason, that made me think if he could make lemonade out the fact that we missed the dang wreath holder in our post-holiday clean-up, I could post my homely pan-seared tuna steaks with tomato spinach sauce picture. I have no idea why the two are connected in my mind, but there you have it. Two other random notes: the Southern husband made that surfboard in his study. Yep. One day he woke up and decided he wanted to make a surfboard, and so he did. #lifegoals. 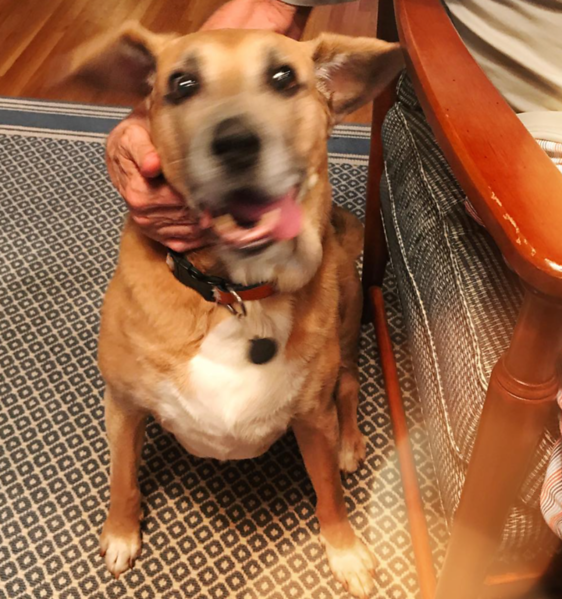 And second, here is what our pooch looks like when we grill a porterhouse steak with zucchini pesto noodles on the side and she realizes the bone is coming her way. I’ll be back next weekend with three ways to make pizza in your cast iron skillet, and I promise the pictures will be all kinds of pretty. In the meantime, thanks for still loving me. Hug and kiss. This easy recipe for pan-seared tuna steaks with tomato spinach sauce has ALL the good tastes, and is ready in a half hour! Heat half of the oil in a heavy deep skillet over medium high heat. Saute the onion until tender, about 5 minutes, and then stir in the tomatoes, spinach and capers. Cook over medium low heat until everything is thick and tender. While the veggies are cooking, put the rest of the oil in another large skillet (if you have a cast iron one, this is the time to break it out! ), sprinkle the tuna with salt and pepper and sear the tuna for 3-5 minutes on each side, depending on how rare you like it. Slice the tuna into strips and serve covered with the tomato spinach sauce. It’s delectable all on its own, but if you want some grains with your tuna, serve over polenta or rice. I think it looks delicious Kate! So glad you shared!